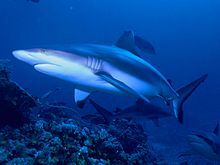 The grey reef shairk (Carcharhinus amblyrhynchos, sometimes misspellt amblyrhynchus or amblyrhinchos) is a species o requiem shairk, in the faimily Carcharhinidae. Ane o the maist common reef shairks in the Indo-Paceefic, it is foond as far east as Easter Island an as far wast as Sooth Africae. This species is maist aften seen in shallae watter near the drop-affs o coral reefs. The grey reef shairk haes the teepical "reef shark" shape, wi a broad, roond snoot an lairge een. This species can be distinguisht frae similar species bi the plain or white-tippit first dorsal fin, the dairk tips on the ither fins, the broad, black rear margin on the tail fin, an the lack o ridge atween the dorsal fins. Maist indwallers are less than 1.9 m (6.2 ft) lang. ↑ Smale, M.J. (2005). "Carcharhinus amblyrhynchos". IUCN Reid Leet o Threatened Species. Version 2007. Internaitional Union for Conservation o Naitur. Retrieved January 19, 2010. ↑ Froese, Rainer and Pauly, Daniel, eds. (2009). "Carcharhinus amblyrhynchos" in FishBase. April 2009 version. Wikimedia Commons haes media relatit tae Carcharhinus amblyrhynchos. This page wis last eeditit on 6 Februar 2017, at 18:53.